A constellation of some of Sweden's finest bebop musicians. Highly influenced by the early recordings of Charlie Parker and Tiny Grimes, this group offers old school swing-meets-bebop with a rare level of authenticity, energy and creativity. Jen Hodge, a busy Vancouver-based bass player, bandleader, and arranger, is a versatile musician who can be found playing with a wide variety of artists all over the world. When Jen is leading the band, she likes it hot – hard swinging grooves, boisterous New Orleans style horns, cheeky lyrics, intriguing arrangements, plenty of spontaneous fun, and an evident, infectious love for making music. Jen’s particular expertise in the arena of traditional jazz has taken her to stages all over Canada, the USA, China, Spain, France, the UK, and the Caribbean. On home turf, Jen can be found leading a band on Wednesday nights at Guilt & Co, a bar in Vancouver’s historic Gastown district and a major hub for the city’s musical creative minds, where she has held a regular gig since January 2011. We are happy to have Jen Hodge at Herräng Dance Camp this year, were she will be playing together with some of the local stars of the Swedish swing jazz scene. Since the start in 2016, Lönnkrogen have been playing for a full house - the Scala theater in Stockholm - every other Friday. With their swinging 20's tunes they take us back to the time of Prohibition, when everybody - young and old, rich and poor - would find their way to the speakeasies to forget their problems and enjoy the music. Lönnkrogen have become veterans on the music scene in Stockholm and around Sweden. This will be their debut at Herräng Dance Camp and it will be a night to remember! Hornsgatan Ramblers is a jazz band from Stockholm Sweden. Their main focus is set on rhythm and swing, from the more or less legal ballrooms of New York in the thirties and forties. With the bands' own adaptations and arrangements of the music of jazz giants such as Duke Ellington, Jimmie Lunceford, Count Basie, Cab Calloway and Charlie Christian, the Ramblers have developed a sound of their own. By now that unique sound has brought the band to countries such as Greece, Italy, Germany, Finland, Turkey, Lithuania, UK, Belgium, Netherlands, etc. And of course all over Sweden. The band was started in the autumn of 2009, when a few swing dancers in Stockholm decided to form a band and to start playing the music that they loved to dance to, to explore it further and reach a deeper understanding of it. The band name comes from a street in the neighbourhood in Stockholm where most members work and live, and where the world famous Chicago Swing Dance Studio is located – and in which the very first rehearsals took place. Several of the band members also dance in the renowned swing dance company Harlem Hot Shots and teach swing dancing, and have won and judged numerous dance contests all over the world. Hoodlums of Bebop was formed in 2014 for a special bebop show at the Chicago Swing Dance Studio. The quintet consists of some of Stockholms finest Jazz musicians who have played together for many years in various constellations and who took this opportunity to form an all-star bebop quintet with the classic instrumentation of the legendary Parker/Gillespie Quintet from the early fourties. The music is based on Parker/Gillespie tunes, but the Hoodlums of Bebop also plays some swing hits from the classic big band era and a couple of slow drags honoring Parkers love for the blues. Hoodlums of Bebop has performed several times at the Chicago Swing Dance Studio and had a celebratedperformance in Herräng last year. Also worth mentioning is that the drummer John Hugardt is an accomplished lindy hopper who makes the band swing in all the fun dance tempos. The idea was to form a band with top jazz and swing players in Stockholm. The four horn players in the front line play a important role in the band. With cleverly written arrangements, mostly by Klas Lindquist and Fredrik Lindborg, the band can play softly as a small group and seconds later explode in a big band fortissimo. The rhythm section gives the band a bouncing ground where solos and ensemble playing become a joy. The members of the Stockholm Swing All Stars are considered as the best in its field in Sweden. The Stockholm Swing All Stars play swing and jazz music suitable both for concerts and for dancing. The band often plays at lindy hop and other dance events as well as in concert halls around Europe. In 1987, the SWING DANCE ORCHESTRA was founded under the direction of “Swing King” Andrej Hermlin. Since then it has developed into the most outstanding and successful swing band in Germany. In addition to frequent radio and TV performances, the orchestra has played countless gigs in prestigious hotels, delighted its audiences in German and European concert halls and has been engaged for glamorous, glittering ball events. 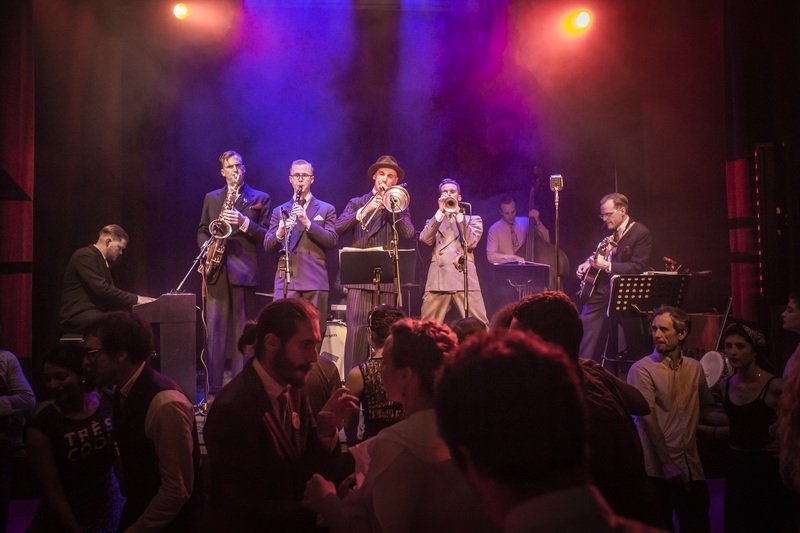 The SWING DANCE ORCHESTRA has undertaken highly successful international tours to major cities including Brussels, Zurich, Hong Kong and London. In New York – the old and new metropolis of swing - Andrej Hermlin has appeared with his musicians in the renowned “Rainbow Room” of Rockefeller Center and in the not less famous “Hotel Pennsylvania“. Recently the orchestra has performed in several film productions, among them “Taking Sides” under Oscar-winning director István Szabó and “Cold is the Breath of Evening” after a novel by Ingrid Noll. The orchestra has a multifaceted repertoire containing many familiar but also rarely played original American arrangements from the ‘30s. These include melodies of Benny Goodman’s orchestra, Artie Shaw, Jimmy and Tommy Dorsey, Duke Ellington, Cab Calloway, Glenn Miller and many other stars of the swing era. The SWING DANCE ORCHESTRA is authentic down to the details: the sound, the arrangements, the microphones and music stands, the instruments and the musicians’ outfits are like the American originals of that time. The sound of this big band is completely distinctive and not driven by trends or fads. Most important, the SWING DANCE ORCHESTRA plays music for listening and dancing – from an era whose glitter and glamour continues to fascinate audiences today. Hasse Ling and his Syncopators of Swing play swinging music from the golden years of jazz. Most songs are from 1920's through 1950's. Favorites are saxophone based small band swing of the 1940's with a touch of early rhythm & blues. The repertoire is based on swing mainstream and blues. The group has been actively playing for over 30 years with three original members still going strong on stage. Hasse Ling, the band leader has been playing jazz on almost everything that sounds since he was a child. Now he focuses on saxophones and some vocal. Bosse Carnestedt is the senior member who bought his first string base in the late 1940's. His rhythm is solid and genuine and much appreciated in the band. Hasse Carlsson also senior in the band, is one of the most requested drummer in town which has kept him busy since the 1950's. He has a vivid swinging and traditional rhythm deeply rooted in timeless jazz. Later on Peter Buskas joined the band with his arch top guitar. He alternates rhythm guitar with plying solo's and singing a few songs. You can hear influences from early electric guitarists and Django. The newest member of the band Leo Linberg, wasn't even born when they started to play. Nevertheless, this young multi instrumentalist plays keyboard and piano like no one they've have heard before. It is an understatement to say he is excellent in his profession. Hasse Ling and his Syncopators of Swing regularly plays for lindy hoppers and others all over the region but also visits jazz clubs in Stockholm every now and then. The band feels fortunate and lucky to play swing music which hopefully to keep them young and happy for ever. Othella Dallas, the Grand Old Lady of Jazz and Blues, was born 1925 in Memphis. Her mother, also a singer and a great pianist/composer, was the first black singer to appear on St. Louis Radio. Louis Armstrong was a regular guest in her grandmothers house and W.C. Handy, the composer of St. Louis Blues was her babysitter. Being surrounded by all this talent, she started at the age of five to tap and earn money for the family. When Katherine Dunham discovered her at a school talent show when she had just turned 19, she immediately got engaged to join the Dunham School of Theater and Dance in New York. After her graduation she became a dance teacher and an acclaimed soloist in the company. The tours lead her to South America and Europe, where she met her future husband. In 1949 they get married in Paris. Already in 1950 she has two dance schools, one in her new hometown Zürich and one in Paris. Inspired by her husband who is now also her manager, she starts a second career as a singer in the Jazzclubs of Paris being on stage with Edith Piaf, Sidney Bechet and Josephine Baker. Just 3 years later, back in New York, the famous singer and composer Phil Moore becomes her new manager. He writes songs for her and soon she is touring Canada, the USA und Kuba. Being on stage with King Curtis and Nat King Cole and appearing in the same program with Sammy Davis jr. at the Apollo Theater in Harlem. Duke Ellinton wrote two songs for her and she was part in his show Jump for Joy.The Opera Free and Easy, directed by Quincy Jones led her back to Switzerland in 1960 where she has stayed ever since. Othella then toured many coutries like Africa, Israel , Germany and Russia. Still always faithful to her first passion in 1975she opened the Othella Dallas Dance School Basel, where she is teaching Katherine Dunham technique as one of the rare living legends of this cultural heritage. For the last 10 years Othella has been Artist in Residence at the Jazzfestival of St.Moritz, highly respected for her incompareble liveshows. A great documentary, Othella Dallas „ What is luck“ by Andres Bruetsch was released for her 90th Birthday. Experiencing Othella is touching upon the great musical history of Jazz and Dance and is deeply inspiring. This year we have the great pleasure to welcome Othello Dallas back to the camp, performing together with some of the local stars of the Stockholm jazz scene. Kustbandet is a Swedish jazz orchestra founded as a school band in Stockholm in 1962 by Christer Ekhé (né Jansson) and Kenneth Arnström. Originally playing in traditional New Orleans jazz style and, as the band grew, moving towards big band style as played by Louis Armstrong, Duke Ellington, Luis Russell, Jelly Roll Morton et al. in the 1920s - 1930's. Kustbandet perform regularly at concerts, dances and festivals and have toured extensively in Europe, Asia, Australia and The USA. Highlights have been three Nobel Prize Galas, Prairie Home Companion radio shows and New Orleans Jazz and Heritage Festivals. Kustbandet was formed in the wake of the "jazz war" between traditionalists and modernists in the early 1960s. With time these labels have become redundant, as jazz styles have become more homogenous. This is also reflected within the orchestra nowadays moving freely between the early jazz styles. Kustbandet's concerts are labeled: "From Ragtime to Swing" presenting blues, ragtime, boogie woogie, Dixieland, swing, gospel, New Orleans brass band-style. The band has recorded more than 20 albums (LP, EP and CD), mainly for the labels Kenneth Records, Stomp Off, Circle Records and Sittel. Jens "Jesse" Lindgren has been the band leader since 1987.